PB & J sandwiches have been popular for years. 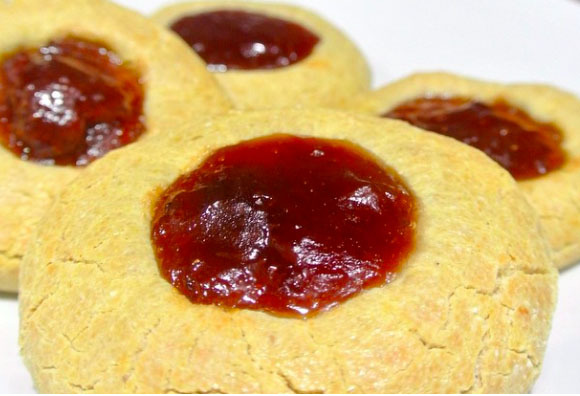 So why not make peanut butter and jelly cookies?Preheat oven to 320°F. Mix all ingredients except preserves into a sticky dough. Add a little more almond flour or protein if it’s too sticky. Rub a little oil on your hands before forming dough into 8 balls. Slightly flatten each ball between the palms of your hands, then make in imprint with your thumb in the center. Fill each hole with a teaspoon of preserves. Bake for 20 – 25 minutes, or until golden brown. Leave them out to sit on your baking tray for about 15 minutes to allow the preserves to set. Makes 8 peanut butter and jelly cookies. Store in refrigerator.